OK, so we like the keyboard. Perfectly sized, but not too flashy. Plastic, but not smooshy. Just the right size for us to touch type on without any real acclimatization period. Good. Got it. Let's move on. But it even has a decent sized right-shift button and a space bar which is slightly higher than the chassis and is easy to press! No, really. Enough. Moving on. No matter how good the keyboard is, there are still some flaws with the various inputs and outputs of the Acer Aspire One. Some of them are forgivable, but some are fairly serious. Let’s start with the least of all the issues – the trackpad. 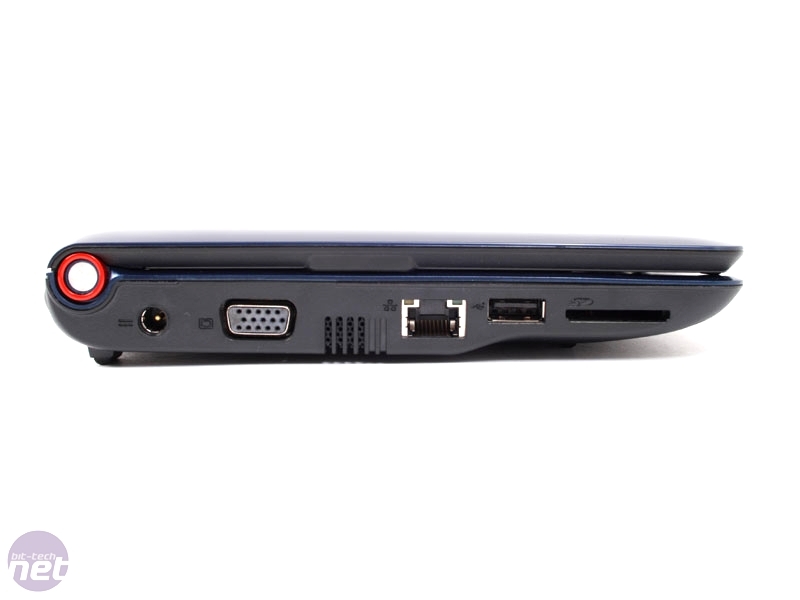 There’s nothing really all that wrong with the trackpad of the Acer Aspire One. I mean, it works after all else is said and done. It just isn’t all that great to use when compared to the competition and makes that same mistake as the HP Mininote 2133 in that is has the mouse buttons to the left and right of the pad, not directly beneath which feels more natural. You can kind of see why they’ve done it – positioning the buttons this way lets Acer shave valuable centimetres off the depth of the chassis, but the downside is that even the most mundane of tasks suddenly become a two-handed affair. Depending on what you’re trying to do with the Aspire One at half-past three in the morning in a dirty LA motel that smells of old dishwater and rot, that can be an issue. The buttons themselves are also a little undersized in the width department, which is the one which counts when the buttons are positioned this way. The buttons are just so thin and so flush with rest of the chassis that they can be hard to press quickly, though at least they have that satisfying but non-too-stiff click-clack to them. At least you know when you’ve pressed one. 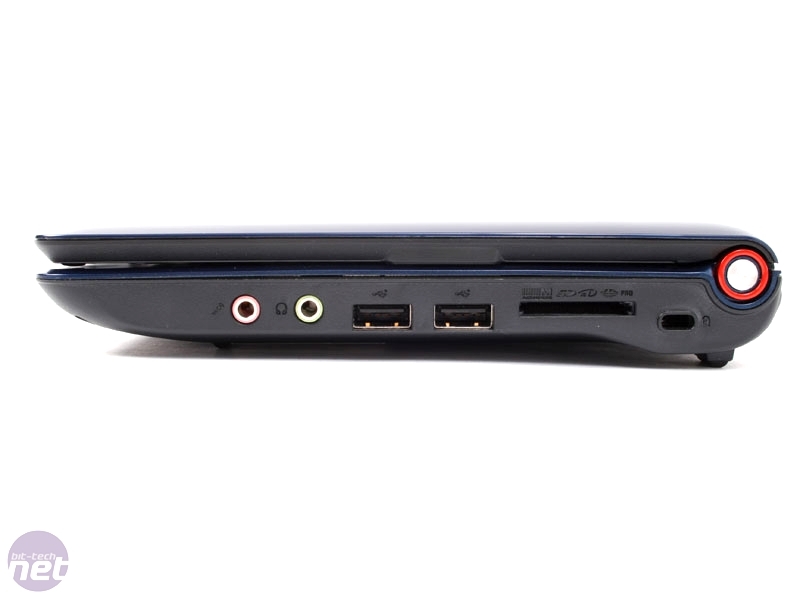 Other parts of the Acer Aspire One have less redeemable qualities – namely the speakers, which sound tinnier than the cutting of foil with a cheap razorblade. We took the speakers for a spin with a few different and completely legal music tracks, including some High Speed Scene and Meat Loaf, noting that the bass sounded thinner than scientologist supermodel. The volume is good at least, getting up to the kind of levels that would make the Acer Aspire One suitable for use at any party where you don’t especially want to listen to what everyone else is saying. Pushing the volume up though just makes the awful sound quality even more apparent. Still, there is some good news and the reality is that although the speakers are about as hi-fi as a guitar made from the stretched and worn-out elastic from a pair of second-hand underpants, you aren’t likely to be using them all that much and even if you are planning to use the Aspire One at a party, then you can always hook up some extra speakers instead. It’s not like you’ll be able to watch DVDs on One or anything – it doesn’t have a drive. On the plus side, the screen of the Aspire One is pretty good in terms of both quality and brightness, with plenty of scalability when it comes to illumination, which is handy when the battery starts to run low. For those scenarios there’s also an on/off switch for the WiFi card, which is spring loaded and located below the cursor keys. Handy, that. The Martin Test, though something originally put in place for case reviews, can also be adapted to the Acer Aspire One by looking at the power button as an overall signifier of build quality and you’ll be pleased to know that the Aspire One passes with flying colours. The button is small and illuminated, plus slightly recessed so you can’t press it all that easy. Coming round to the webcam finally the quality is surprisingly detailed, though a little over-exposed and though you’ll never really likely to use it beyond the quick fiddle and the occasional embarrassing picture of your significant other, it is a nice toy to have at your disposal and at least the chassis isn’t compromised as a result. Acer is set to launch an Aspire One netbook with a multimedia co-processor and 1280x720 screen capable of playing high definition media.